The bustling bourse at the Chicago ANA. 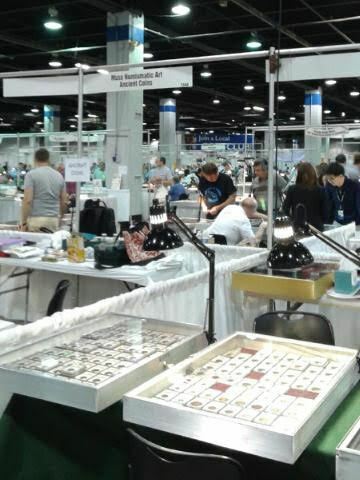 My second day at the Chicago ANA World’s Fair of Money started with a visit to the BCCS (Barber Coin Collectors’ Society) meeting. Q. David Bowers and Dennis Tucker presented the new Guide Book of Barber Silver Coins, and several exciting new developments for the society were announced, including a glossy, new face for their journal and an upgrade to their website, pending completion. New coin-variety discoveries were enthusiastically discussed, and a couple of awards were given to members. It was engaging to attend a society meeting and see enthusiasts and collectors of a specific type all gather together to discuss their passion, as well as how to share that enthusiasm and knowledge with other members, or new members in the future. Again I encountered joyfully shared knowledge, a theme that has followed me through every hour at this convention and promises to follow through every hour to come. 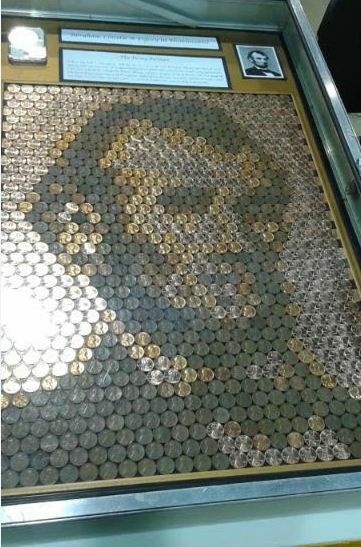 A portrait of Abraham Lincoln constructed out of variously hued Lincoln cents. The rest of my morning was spent wandering the rest of the bourse — which was even larger than I had realized yesterday — including a visit to the Heritage Auctions booth, where I admired some original comic books and beautiful obsolete paper money. I mentioned yesterday my penchant for paper money, and this comes entirely from working on the Encyclopedia of Obsolete Paper Money with Q. David Bowers. As Senior Associate Editor with Whitman Publishing, I am the project-coordinator of the series, and if working with Dave Bowers wasn’t treat enough, to be able to work with him on such a rich and rewarding subject is truly the icing on the proverbial cake. There is so much research to learn from, yet there is still so much to discover. There are thousands upon thousands of large, colorful, intricately engraved notes from obsolete paper money, each with its own story to tell — stories of war, fraud, daily life of the 19th century, economics, legends, mythology…if you enjoy a certain topic, you can probably find a note of obsolete paper money that fits into that category. My favorite vignettes are those that feature animals: whether it be a tiny, crude, horse-drawn plow at the bottom center of the note or a huge, detailed, full-note vignette of a leaping stag. And in this particular category of vignettes, I’d have to say that my favorite is the “cross-eyed buffalo.” I learned the nickname for this curly-haired fellow just today, and he truly has a comical expression on his face, with big, goofy eyes and a mountain of ringlets as a mane. 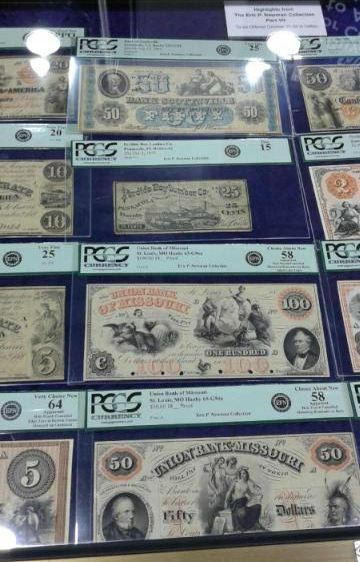 A variety of obsolete paper money. The other rewarding aspect of working on these encyclopedias is getting to know the collectors. The experts. Each state has a half dozen of them or more, all willing and eager to help with previously unseen research, with sharing stories and anecdotes about their notes, with providing images and rarities. The knowledge base for this niche in numismatics is overwhelming, the kindness and enthusiasm of the experts truly a joy to behold. Most of my afternoon I spent interacting with a trio of such collectors, scanning their bank notes to be used in upcoming volumes of the Encyclopedia. Each note we scanned there told a story: canal workers enduring harsh conditions in the pursuit of building the waterway that would change the face of the city they lived in; bank officers signing notes with inverted numbers as a means of security–only sometimes you could tell it was “late on a Thursday night and time to go home,” as one of the collectors joked, when the numbers that were supposed to match up clearly didn’t. In one instance, the state arms for Rhode Island showed up on a note from Illinois simply because the bank officers thought it looked nice. These are the tiny details, the warm interactions, that make numismatics for me. 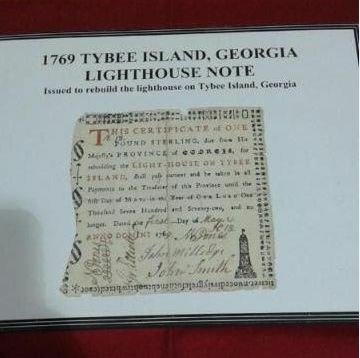 The Tybee Island lighthouse note, a means of raising money to rebuild the wood-and-brick lighthouse that had been destroyed by a storm. Tiny pots and pans! 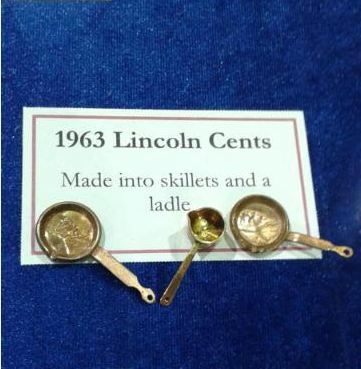 Part of the “Look What They Did To These Coins” exhibit. …then my day was over. I find myself exhausted, but at the same time still buzzing with excitement that another day comes tomorrow, with more discoveries and encounters to have. Another day spent among these fine and feverish people, all so dedicated to their passion, their pursuit of knowledge. I am truly honored to be among them.